On the 8 of March, the cross-fertilisation event for multi-actor project coordinators took place in Brussels and aimed at contributing to the implementation of multi-actor projects of the H2020 Work Programme, a new participatory R&amp;I approach which started as from the first H2020 call 2014. To improve the impact and outreach of the MA projects, the event wanted to incentivise exchange of best practices on a number of emerging issues linked to the running projects. 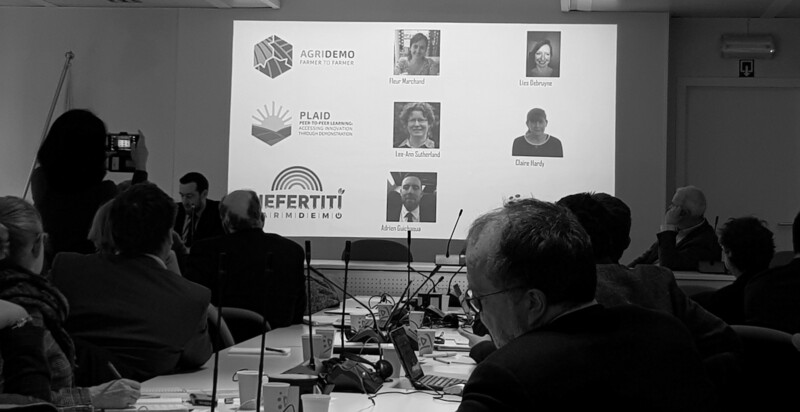 Fleur Marchand presented the collaboration with PLAID and NEFERTITI in the development of a joint strategy and branding (FarmDemo) to reach actors involved in demonstration activities Also other inspiring examples were presented. Within 4 break-out sessions, coordinators could discuss on how to manage Horizon 2020 Multi-Actor projects successfully, how to draft and disseminate Practice Abstracts and on how to develop a profound outreach and communication. The outcome of the workshop will also help the European Commission to improve its guidance towards MA project partners and coordinators. Thematic Networks are a specific type of Multi-Actor projects funded by H2020 Societal Challenge 2 on “Food security, sustainable agriculture and forestry, marine, maritime and inland water research and the bioeconomy”. The first call for TNs was released in 2014: up to now there are 21 TNs focusing in the most urgent needs of agriculture and working for connecting the research and practice in agriculture, boosting existing scientific knowledge and best practices that are not sufficiently known (and applied) by practitioners, and supporting the EIP-AGRI activities. During the workshop, partners from different Thematic Networks (Agrispin, Hennovation, WINETWORK, OK-Net Arable, 4D4F, Smart-AKIS, EUFRUIT, FERTINNOWA and SheepNet) and demonstration projects (AgriDemo- F2F, PLAID and NEFERTITI) have showed and discussed challenges, lessons learnt, solutions and measures taken to increase the impact of each one of the project. Through a methodology that mixes traditional presentations, pitches and interactive workshop interactions, participants also had the possibility of exchanging on how TNs can better interact with farmers and engage with other projects. The importance of translating materials and information in different languages for reaching several audience and, in particular, farmers. The need of identifying a common database or platform for the different TNs’ results, thus avoiding the duplication of platforms that might be counterproductive. The crucial role of advisory services for reaching farmers, particularly in remote rural areas where internet connection is still lacking. The importance of mixing different types of approach for engaging with farmers: online and digital tools, but also direct contacts and peer-to- peer demonstration activities. The successful of demonstration activities for fostering agricultural innovation in farms.